Aurasma: Augmented Reality in the Classroom – CONNECT! Augmented Reality is the digital layering of information overtop of, or in front of, the real world. This content is viewable through a digital device that places it realtime over the real world through the camera. Imagine a pair of eye glasses that could show the Facebook status or most recent Twitter above a person’s head. Augmented Reality browsers are working to make this possible. Some advances have been made in this with browsers such as Wikitude, Layar, Junaio, Acrossair and others. These make it possible to view YouTube videos in the places they were created, or to see a Wikipedia entry for a location at that location. Our students have been given iPads this year and the addition of Augmented Reality options for their work has helped their engagement with the new tool. It is something that would be more difficult with laptops that should remain stationary. Being able to showcase a broader range student work has also been exciting. Our bulletin boards can transform into videos, 3D animations, student interviews and more. Aurasma, is a very intuitive application that allows users to choose their target image and the digital content that will activate when the target is seen by the camera. Our classrooms and hallways have a variety of monsters, explosions, and ,most importantly, student work posted in Augmented Reality. Using the free Aurasma application, visitors can uncover the hidden digital content. The application will find contributors and ‘auras’ close by that can be subscribed to and activated. Students created short videos, less than 3 minutes, presenting what they believed to be the most significant event of 2011. The students also created posters for their chosen event. 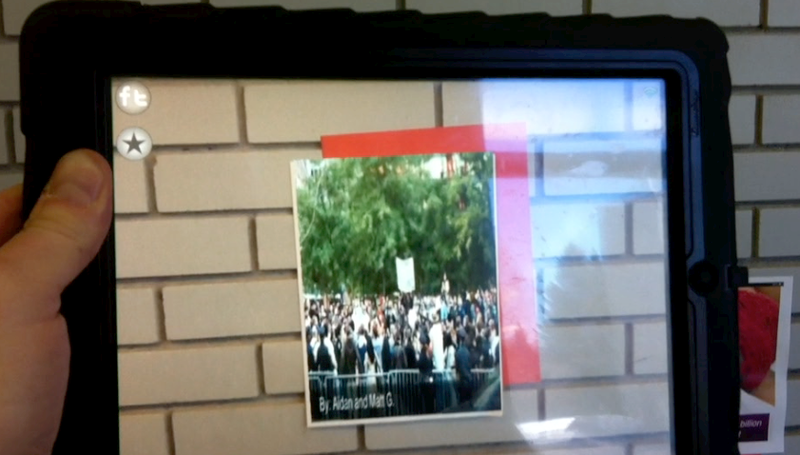 The posters act as the marker, or link, to activate the student videos. Our hallway has been a gallery for the analog posters which activate the digital videos through the iPads. Click here to view the assignment. Below is a video montage of several student projects posted in the hallway. We have a number of QR codes in our hallway and continue to find this as the easiest and most reliable AR tool. Students and teachers can create the QR code which acts as a link to almost any digital content. Students have attached a QR code to their posters which links to simple text explaining the work; you are limited to 250 characters. We have QR codes on a timeline that link to videos or websites that summarize significant moments in Canadian History creating an interactive hallway timeline. Students have also made codes to link to video explanations of their work in Math. 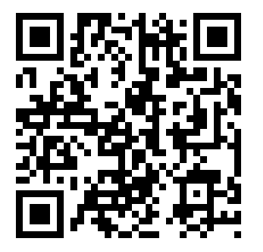 There are several QR generators online we have been using. The following QR code links to a student video discussing some of the most significant historical events in Pre-Confederation Canada. The QR code was posted in the hallway to serve as a physical hyperlink to the student presentation. A previous blog entry describes an AR use in our wood shop elective. String, is an AR app that activates using targets printed from their website. There are currently 4 available in the showcase. The application is free and allows users to activate the digital content when the camera is pointed at the target. The content is incredible and definitely has the wow factor. The Scrawl target is the most interactive and gives the user the ability to create an AR sculpture that emanates from the target. The art created remains in the memory of the device used, though screen shots are effective in capturing the creations. Dan, your blog on augmented reality is very impressive! I enjoyed learning more about your use of Aurasma, QR codes and String as learning and teaching tools. Through these incredible creations you and your students have demonstrated how iPad Augmented Reality applications can be used to demonstrate deep understanding and to provide opportunities in our classrooms and hallways for exciting, engaging, interactive learning experiences for the entire school.